Before I started cooking, I had no idea I could make my own salad dressings. Now, I wouldn’t think to not make my own. My go-to is usually a bit of champagne vinegar, lemon juice, olive oil and salt and pepper. It’s the dressing I use at least a few times a week. There are no measurements, just eye-balling it and adjusting as I go. 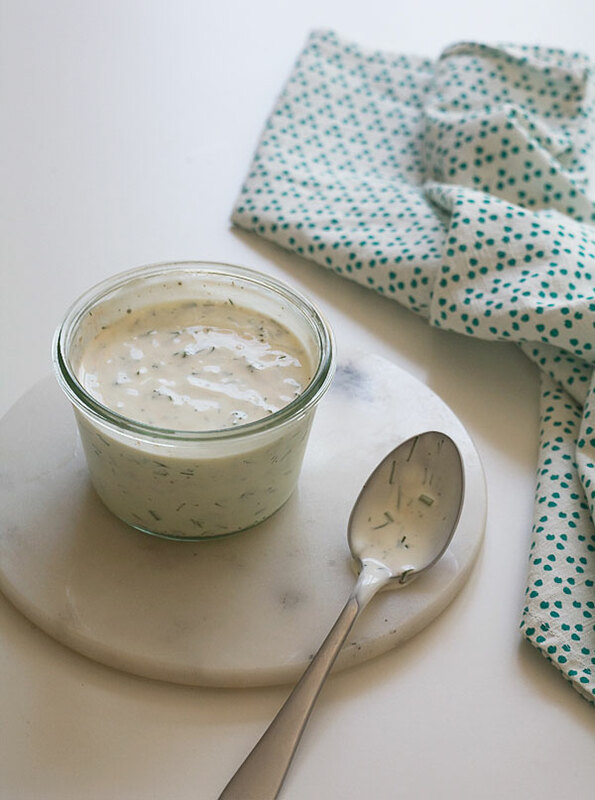 When I want something a bit more indulgent, delicious, I change gears and make a buttermilk ranch dressing. Ranch goes with everything. Absolutely everything. When I was a server in college, I learned that people love it with French fries, slices of pizza, smothered on their baby back ribs, in their burgers, and of course, on their salads. (Salads being the least important.) I was skeptical at first, thinking they were all sort of nutso, but as soon as I tried a slice of pizza dipped in ranch, I was hooked. Call it gross. Call it trashy. It’s probably a little of both of those, but it’s also so, SO good. If you’ve ever looked at the back of a ranch dressing bottle at the supermarket, the long list of ingredients might scare you. It shouldn’t be that involved. 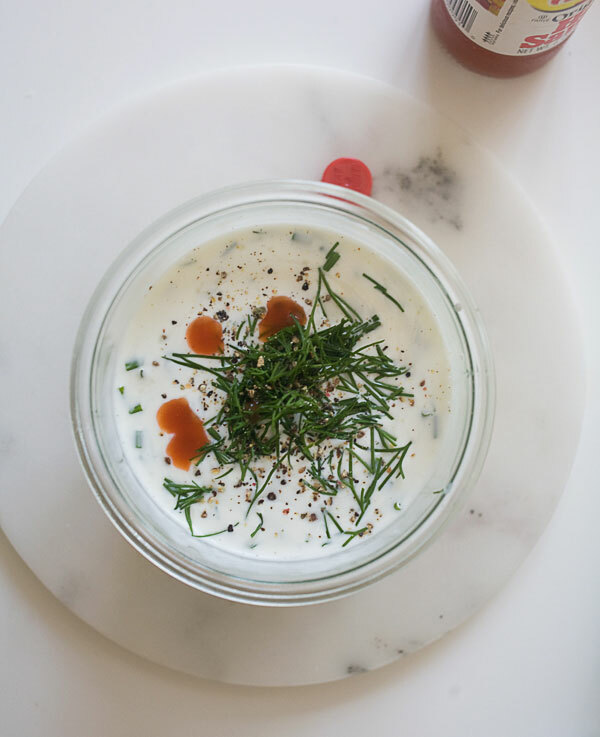 Good ranch dressing has buttermilk, a bit of sour cream, maybe some mayonnaise and lots of fresh herbs. I had a few bundles leftover in my fridge and I figured a jar of ranch dressing was the place they should call home. If you’re in the mood for a rich, decadent salad dressing that tastes fresh without a million ingredients, make this! You’ll wonder why making the homemade version has taken you so long. 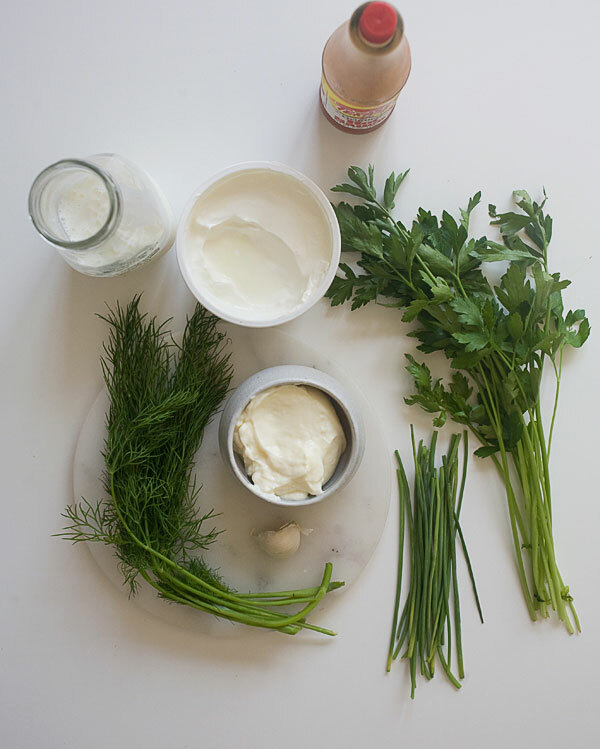 In a medium bowl, whisk together the mayonnaise, sour cream and buttermilk. Add the garlic clove, Italian parsley, chives, dill, lemon juice and dash of hot sauce. Give it a stir until the herbs are evenly distributed throughout the dressing. Add a few pinches of salt and some freshly ground pepper. Taste it and adjust the salt according to your liking.